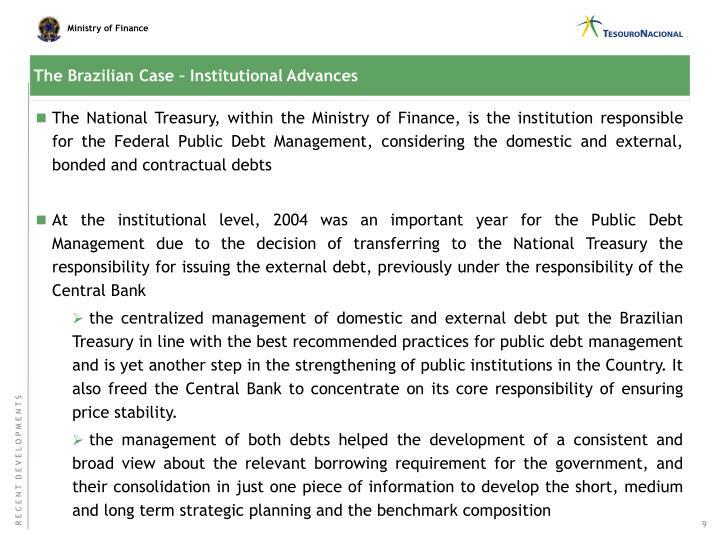 O C T O B E R 2 0 0 5 B R A Z I L I A N P U B L I C D E B T S T R A T E G I C P L A N N I N G A N D B E N C H M A R K C O M P O S I T I O N Brazilian National Treasury Public Debt Theoretical Approach 1 Are Public Debt Level and Composition Relevant ? 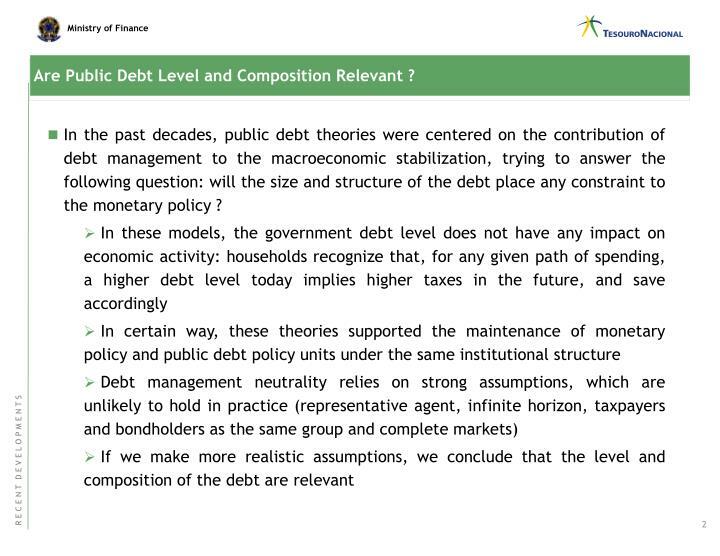 Are Public Debt Level and Composition Relevant ? 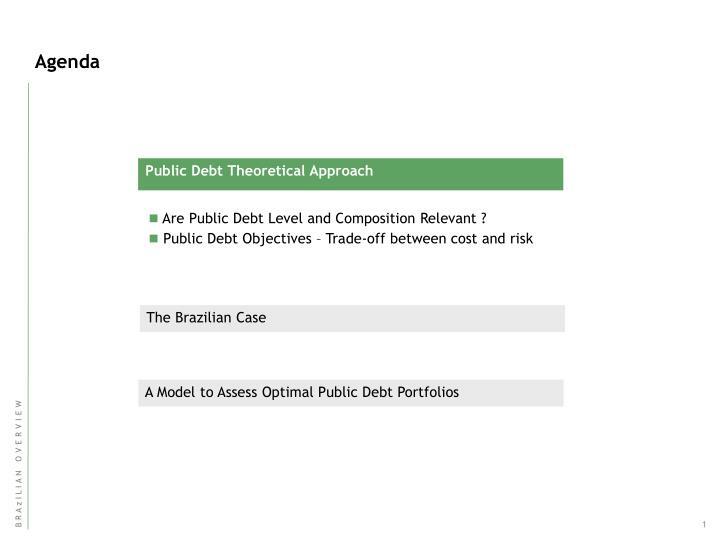 In the past decades, public debt theories were centered on the contribution of debt management to the macroeconomic stabilization, trying to answer the following question: will the size and structure of the debt place any constraint to the monetary policy ? 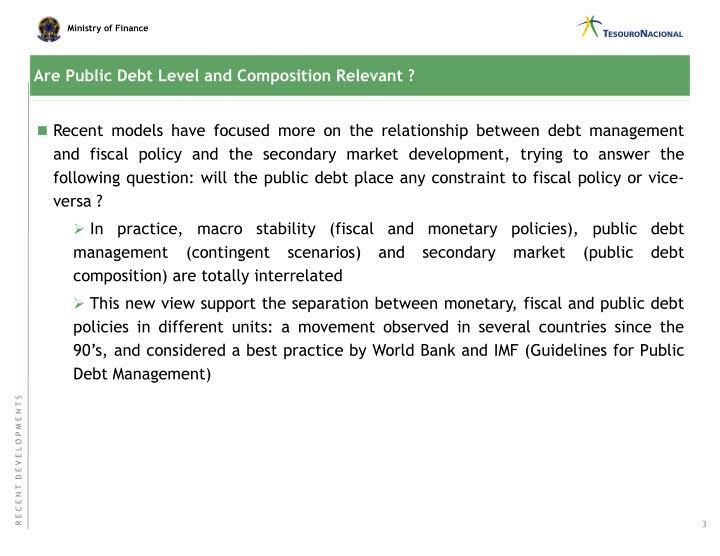 Recent models have focused more on the relationship between debt management and fiscal policy and the secondary market development, trying to answer the following question: will the public debt place any constraint to fiscal policy or vice-versa ? quite different implications for the optimal portfolio - e.g., a debt composed by floating rate bonds might have a relatively stable market value, although it would have potentially great variability in annual debt servicing costs. The opposite can be seen with the nominal bonds. 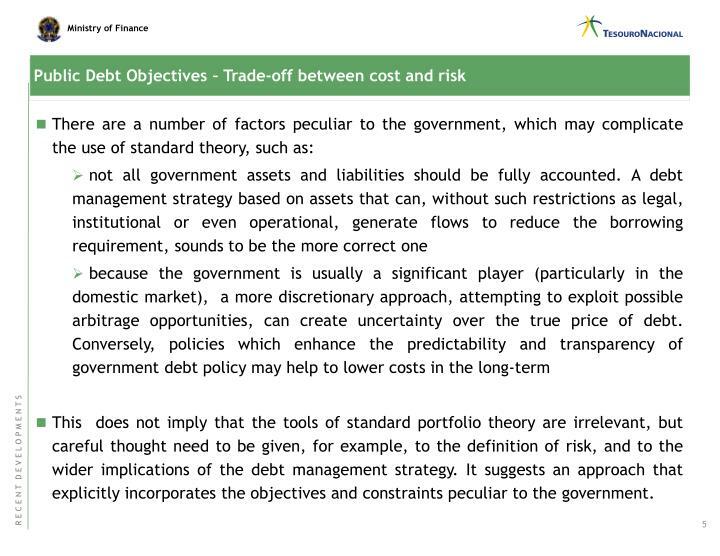 This does not imply that the tools of standard portfolio theory are irrelevant, but careful thought need to be given, for example, to the definition of risk, and to the wider implications of the debt management strategy. It suggests an approach that explicitly incorporates the objectives and constraints peculiar to the government. 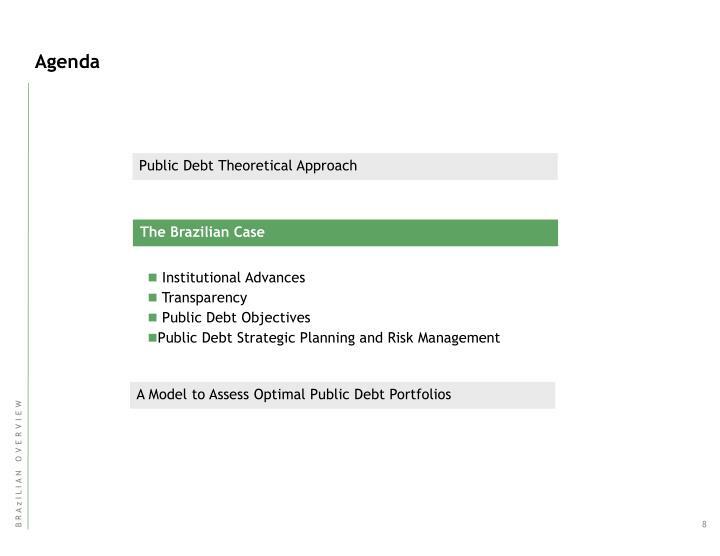 the centralized management of domestic and external debt put the Brazilian Treasury in line with the best recommended practices for public debt management and is yet another step in the strengthening of public institutions in the Country. It also freed the Central Bank to concentrate on its core responsibility of ensuring price stability. 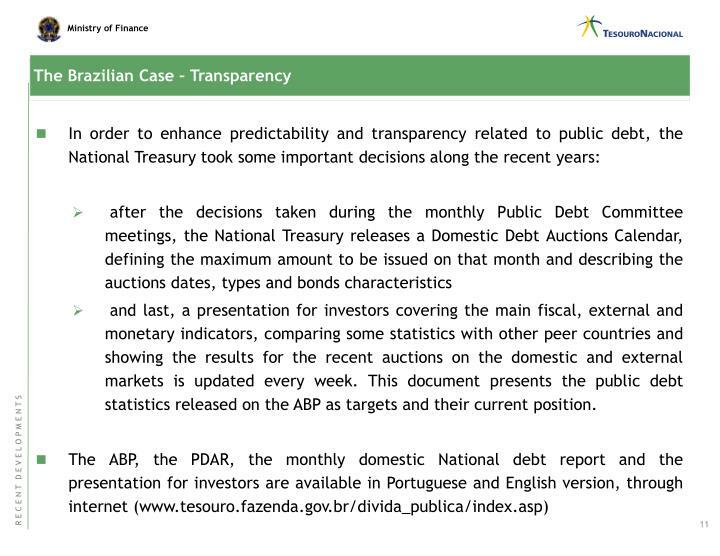 In order to enhance predictability and transparency related to public debt, the National Treasury took some important decisions along the recent years. 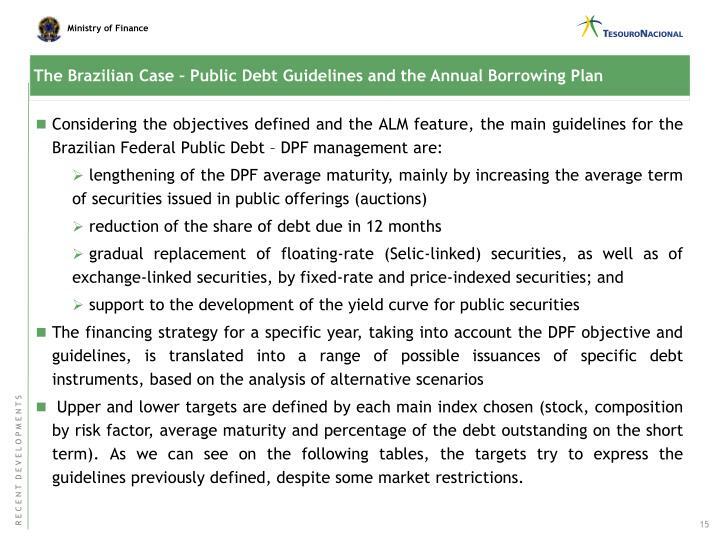 in 2001, it decided to publish at the beginning of each fiscal year an Annual Borrowing Plan - ABP, a document that defines the objectives, guidelines and consolidates the strategic planning for the whole year, increasing year by year the amount of information publicly available. 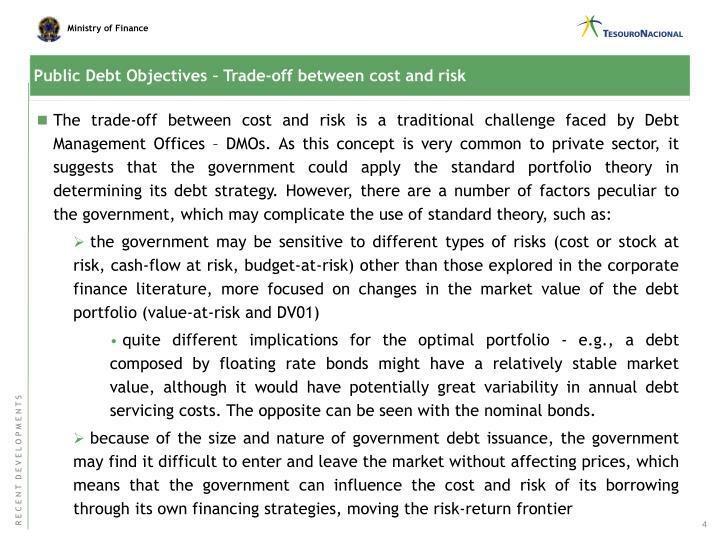 The document also discuses risk management for the public debt and brings improvements in the Asset and Liability Management Model. 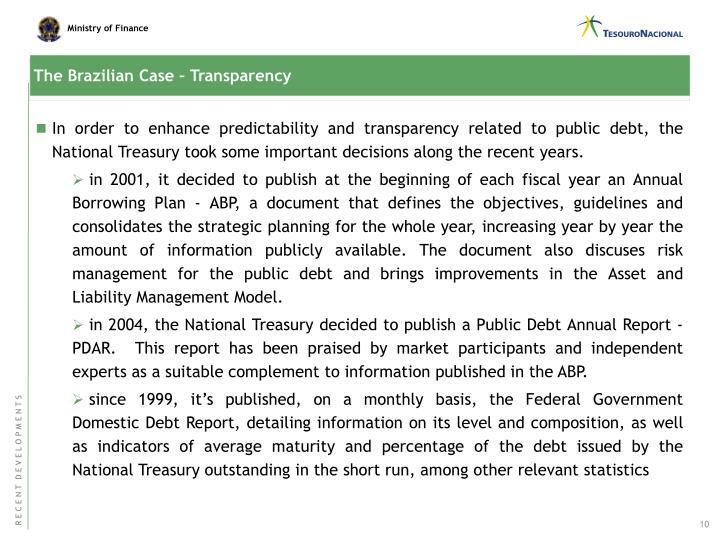 in 2004, the National Treasury decided to publish a Public Debt Annual Report - PDAR. This report has been praised by market participants and independent experts as a suitable complement to information published in the ABP. 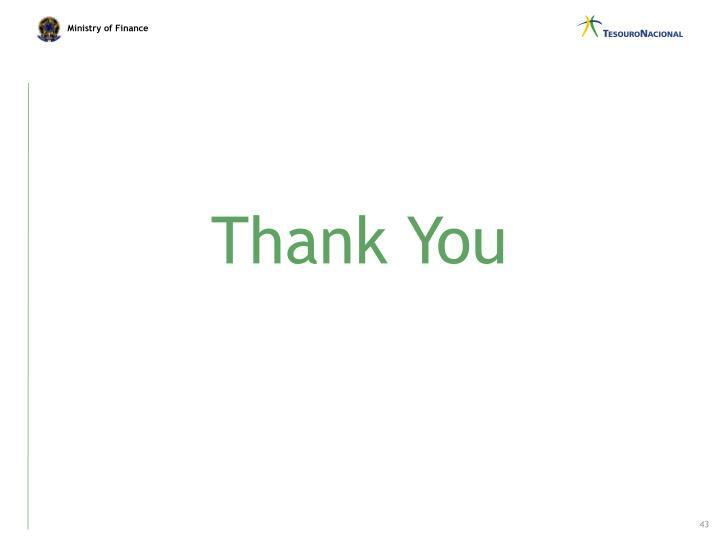 and last, a presentation for investors covering the main fiscal, external and monetary indicators, comparing some statistics with other peer countries and showing the results for the recent auctions on the domestic and external markets is updated every week. 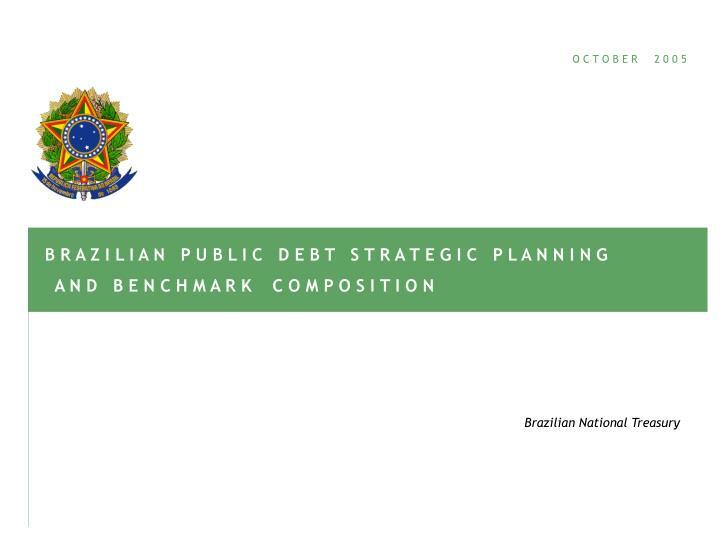 This document presents the public debt statistics released on the ABP as targets and their current position. 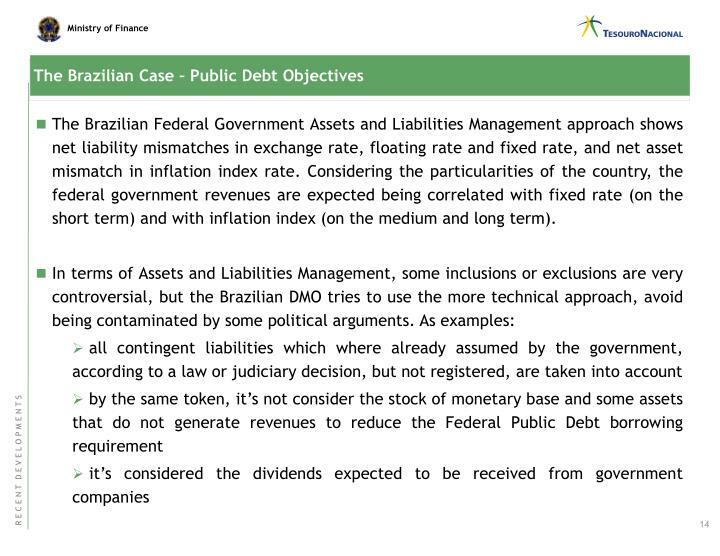 The Brazilian Federal Government Assets and Liabilities Management approach shows net liability mismatches in exchange rate, floating rate and fixed rate, and net asset mismatch in inflation index rate. Considering the particularities of the country, the federal government revenues are expected being correlated with fixed rate (on the short term) and with inflation index (on the medium and long term). 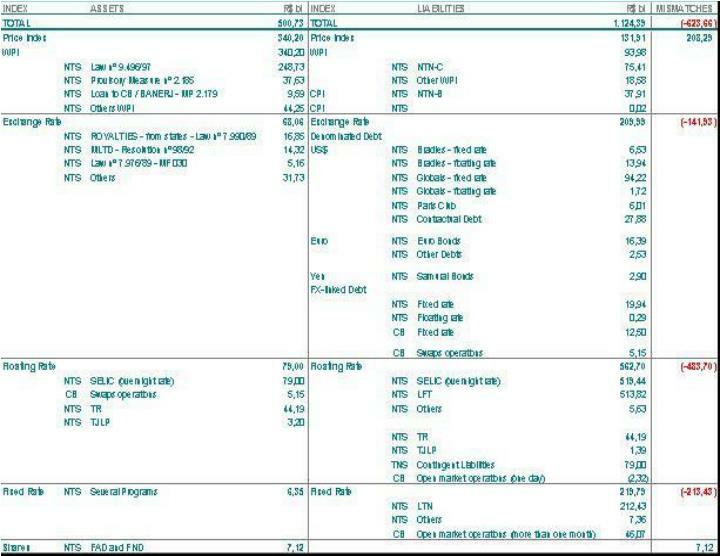 Upper and lower targets are defined by each main index chosen (stock, composition by risk factor, average maturity and percentage of the debt outstanding on the short term). As we can see on the following tables, the targets try to express the guidelines previously defined, despite some market restrictions. 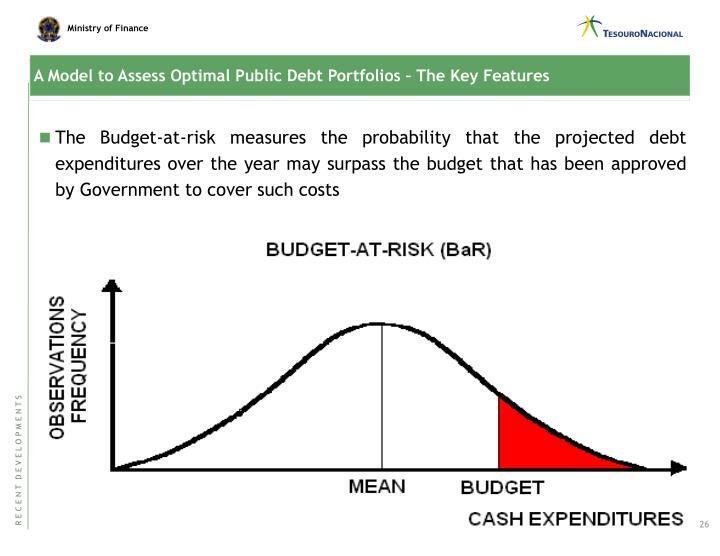 A stress tests highlight the strides made in reducing the vulnerability of the public debt. In particular, the impact on the outstanding debt of shocks in the exchange and domestic interest rates has been considerably reduced since 2002, dropping by more than 60.0% since then. 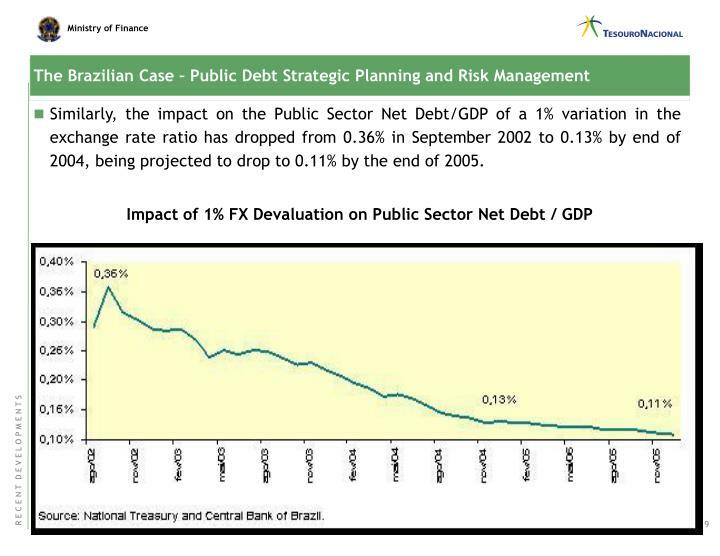 Similarly, the impact on the Public Sector Net Debt/GDP of a 1% variation in the exchange rate ratio has dropped from 0.36% in September 2002 to 0.13% by end of 2004, being projected to drop to 0.11% by the end of 2005. 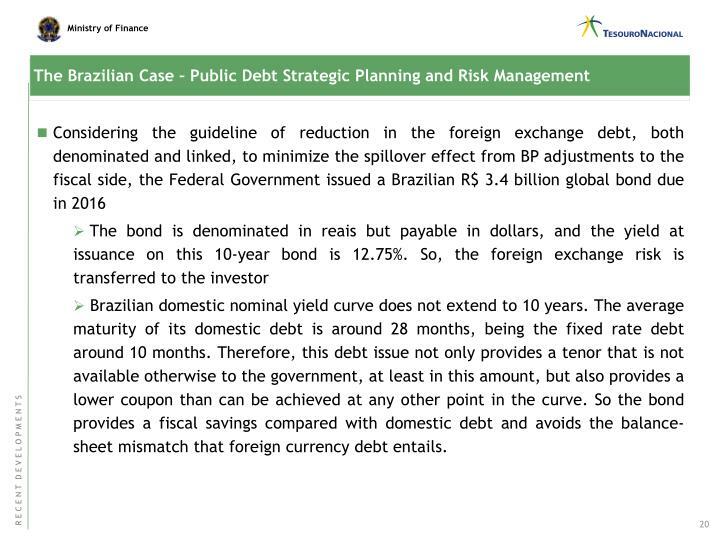 Brazilian domestic nominal yield curve does not extend to 10 years. The average maturity of its domestic debt is around 28 months, being the fixed rate debt around 10 months. Therefore, this debt issue not only provides a tenor that is not available otherwise to the government, at least in this amount, but also provides a lower coupon than can be achieved at any other point in the curve. So the bond provides a fiscal savings compared with domestic debt and avoids the balance-sheet mismatch that foreign currency debt entails. some of them have made impressive efforts to deepen their local markets. They have done so by taking steps to develop a natural long-term domestic investor base, improving corporate and market governance, lengthening the government yield curve, and increasing the mix of local currency government debt to total debt. 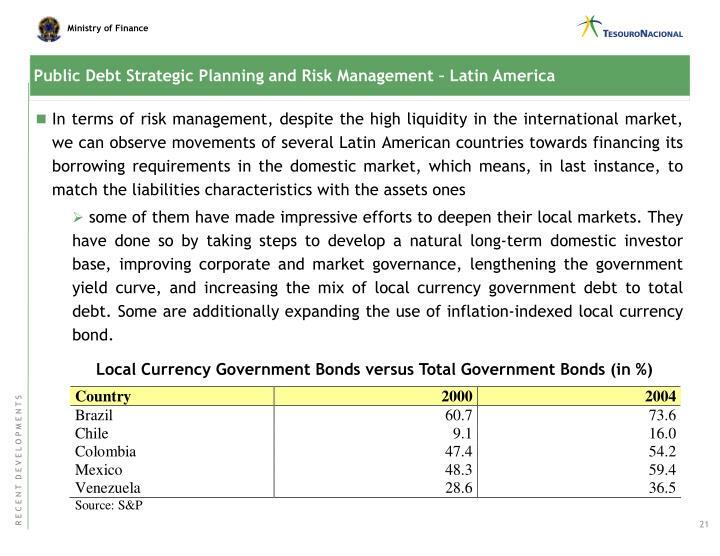 Some are additionally expanding the use of inflation-indexed local currency bond. 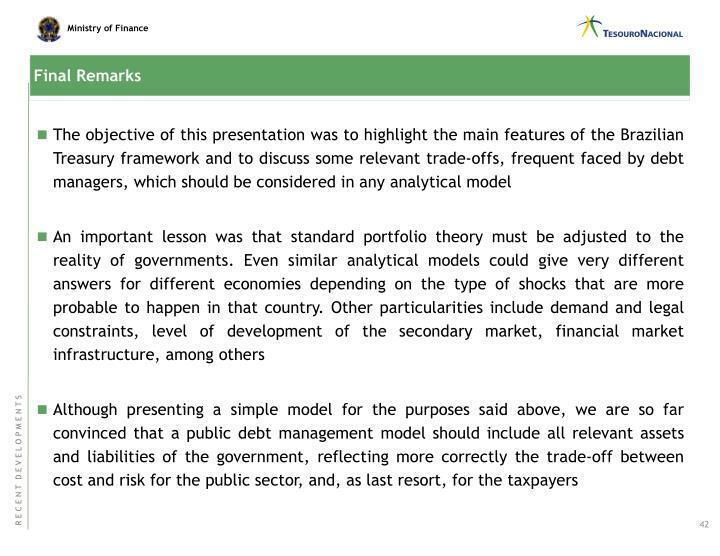 It’s out of the scope of this presentation to detail the model as it has so many particularities, but is important to highlight some key features that we believe a good model should address and the benefits of having this kind of analytic tools. 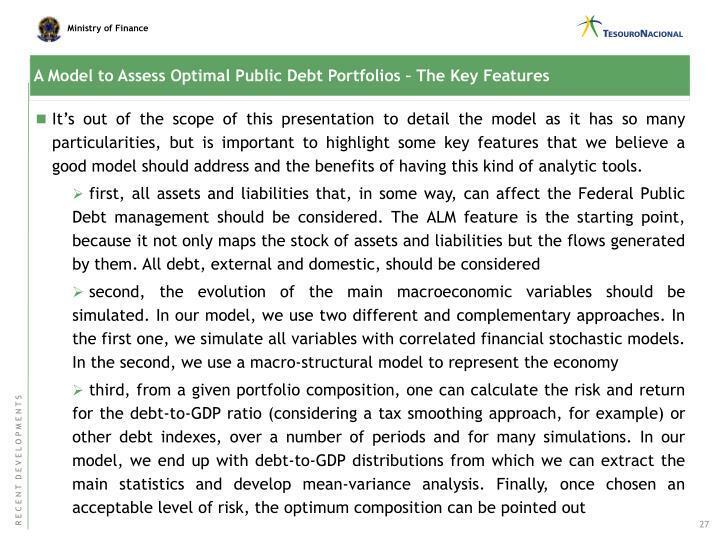 However, to illustrate better some of these features and the trade-offs often faced by the public debt managers we decided to present a more simplified model. 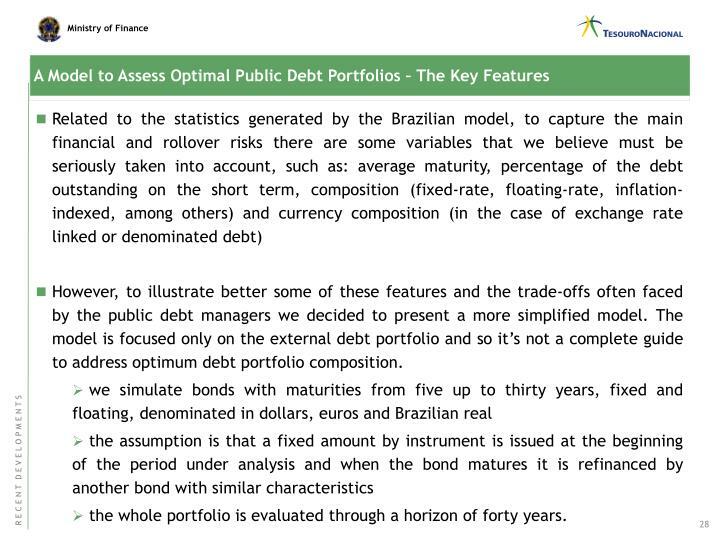 The model is focused only on the external debt portfolio and so it’s not a complete guide to address optimum debt portfolio composition. the whole portfolio is evaluated through a horizon of forty years. This process is used for both R$/US$ and R$/Euro rates, with different parameters for each one. 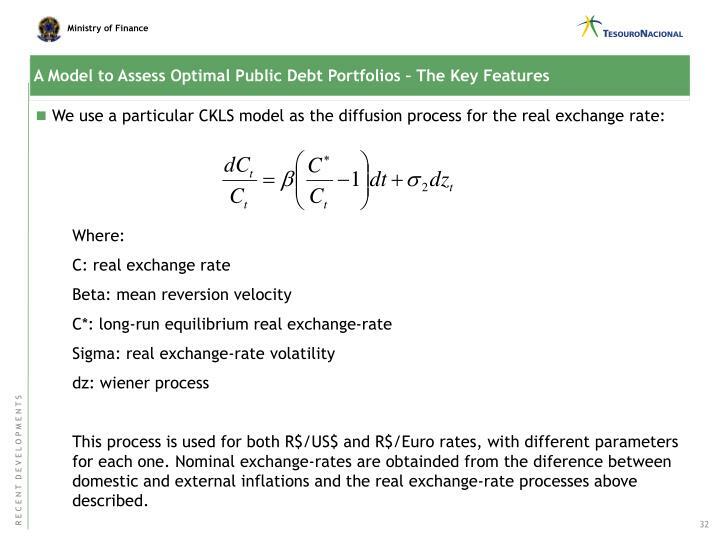 Nominal exchange-rates are obtainded from the diference between domestic and external inflations and the real exchange-rate processes above described. Once we have the yields and the nominal exchange rates, we are able to build the cash-flow for all bonds in different simulations. 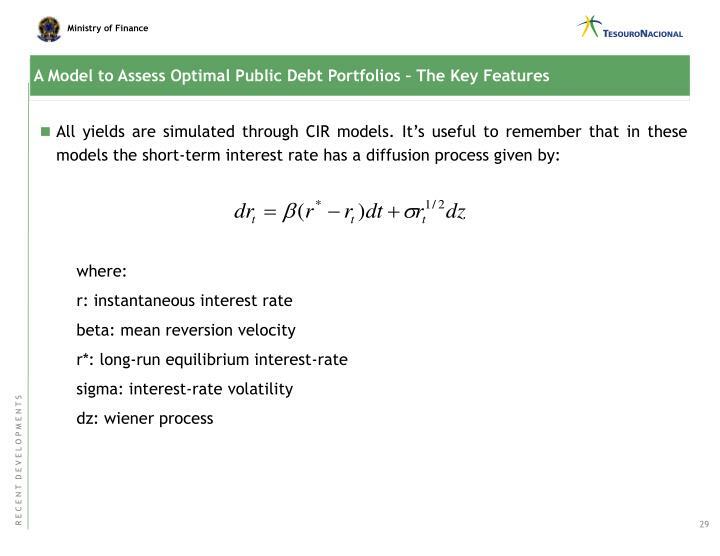 Finally, we can calculate, for each simulation, the internal rate of return (IRR) of each bond, ending up with an empirical distribution of IRR’s. 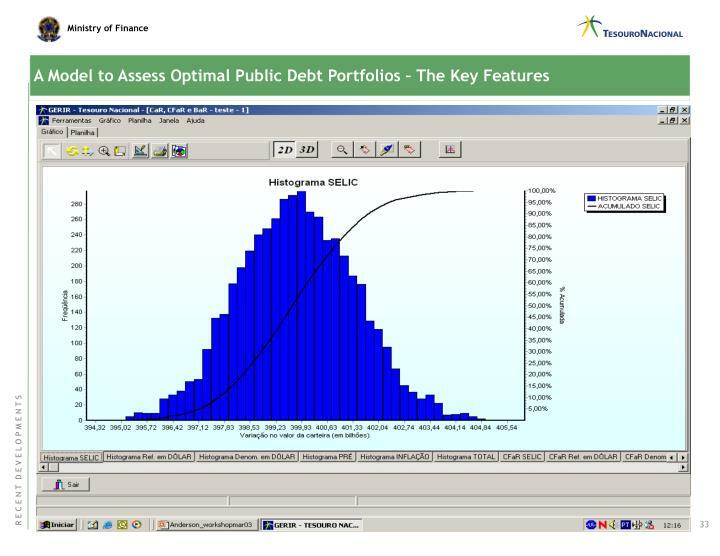 From these distributions we extract the two first moments and develop a mean-variance portfolio analysis. 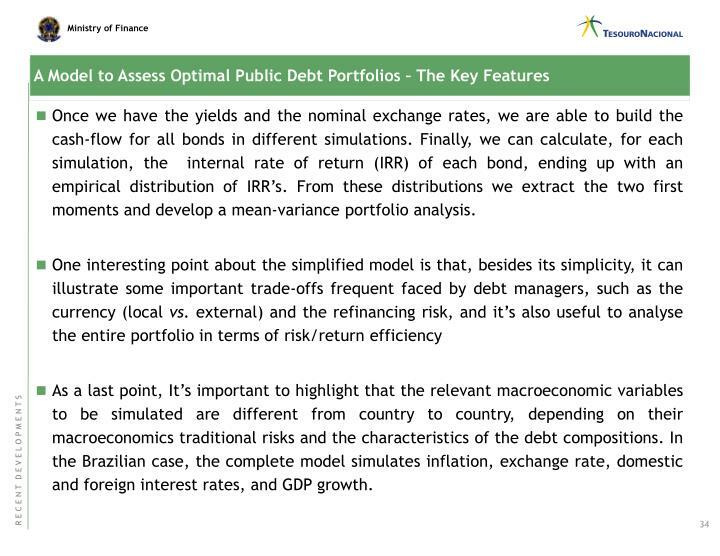 As a last point, It’s important to highlight that the relevant macroeconomic variables to be simulated are different from country to country, depending on their macroeconomics traditional risks and the characteristics of the debt compositions. 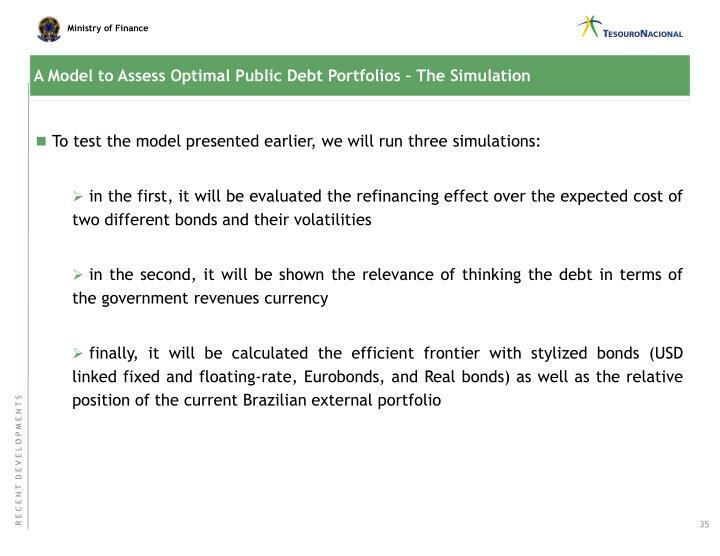 In the Brazilian case, the complete model simulates inflation, exchange rate, domestic and foreign interest rates, and GDP growth. 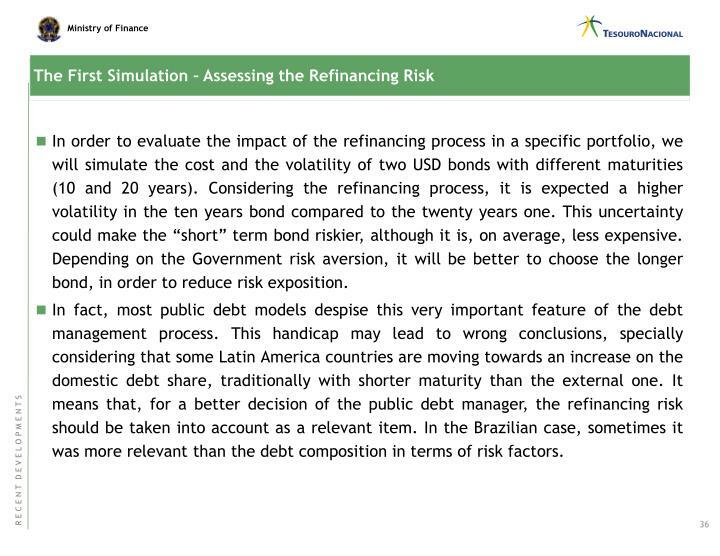 In order to evaluate the impact of the refinancing process in a specific portfolio, we will simulate the cost and the volatility of two USD bonds with different maturities (10 and 20 years). Considering the refinancing process, it is expected a higher volatility in the ten years bond compared to the twenty years one. This uncertainty could make the “short” term bond riskier, although it is, on average, less expensive. Depending on the Government risk aversion, it will be better to choose the longer bond, in order to reduce risk exposition. 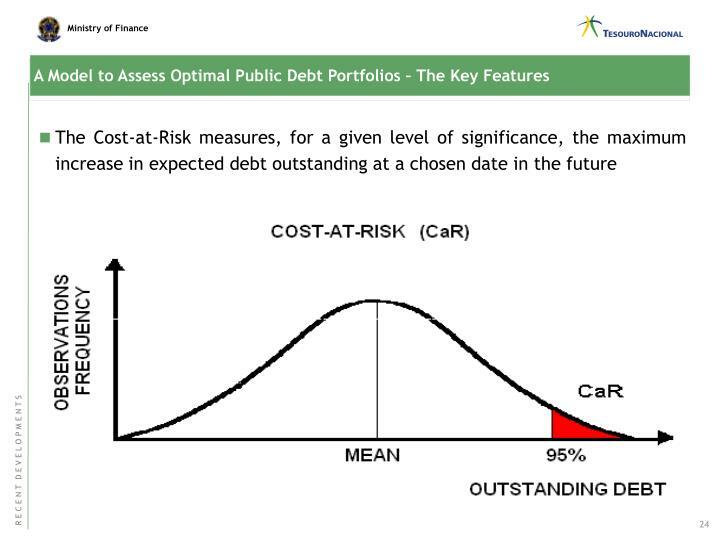 In fact, most public debt models despise this very important feature of the debt management process. 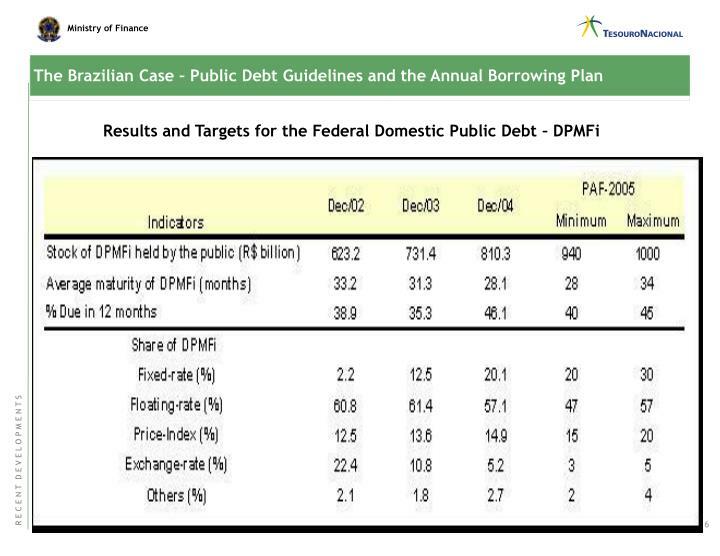 This handicap may lead to wrong conclusions, specially considering that some Latin America countries are moving towards an increase on the domestic debt share, traditionally with shorter maturity than the external one. 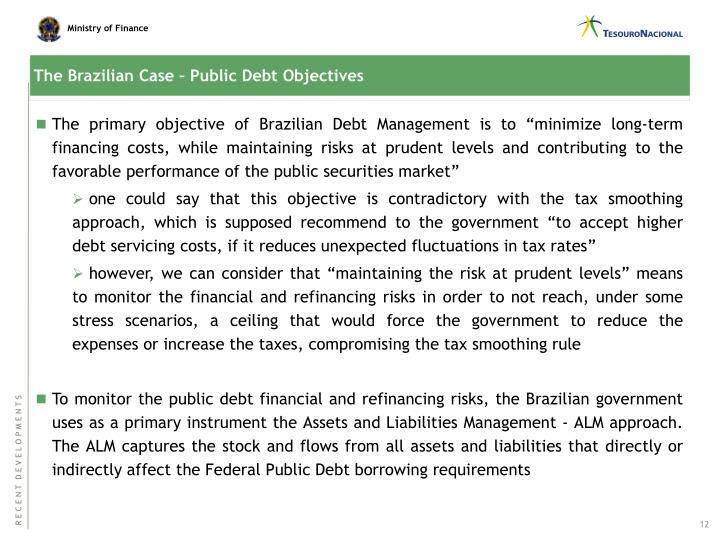 It means that, for a better decision of the public debt manager, the refinancing risk should be taken into account as a relevant item. 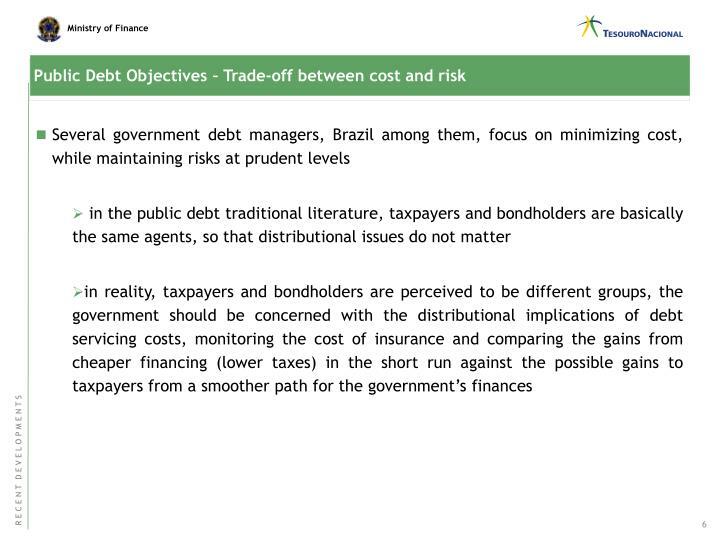 In the Brazilian case, sometimes it was more relevant than the debt composition in terms of risk factors. 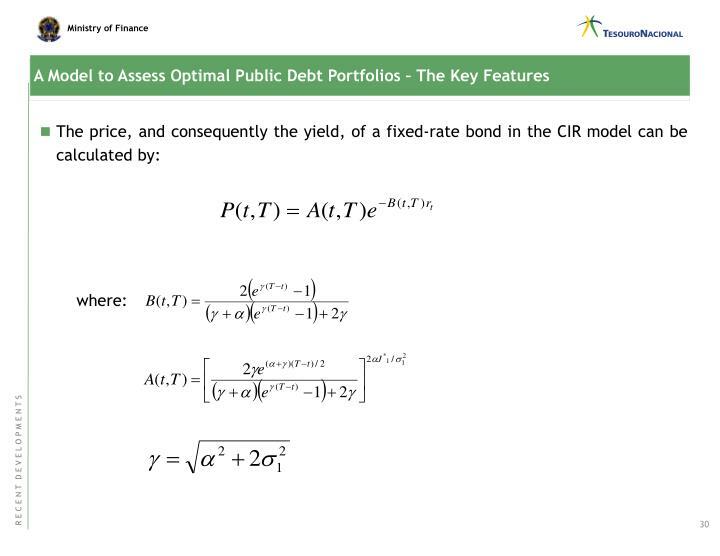 The left table shows us that while the costs are very similar (mean) the “short” term bond has a wider probability distribution. This feature is a result of its higher uncertainty since it will be refinanced two times more than the twenty years bond. The right table shows the data used to draw the efficient frontier. 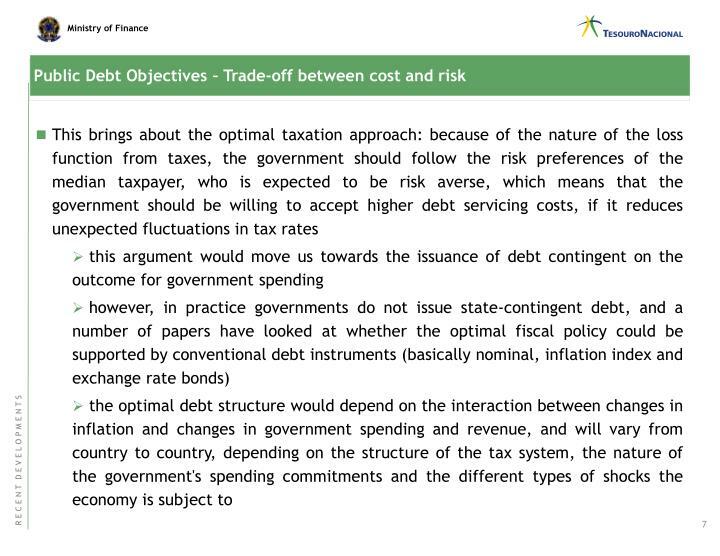 In the case of public debt, efficient frontier is drawn in the opposite direction of a “traditional” efficient frontier since the main issue here is to minimize the costs. 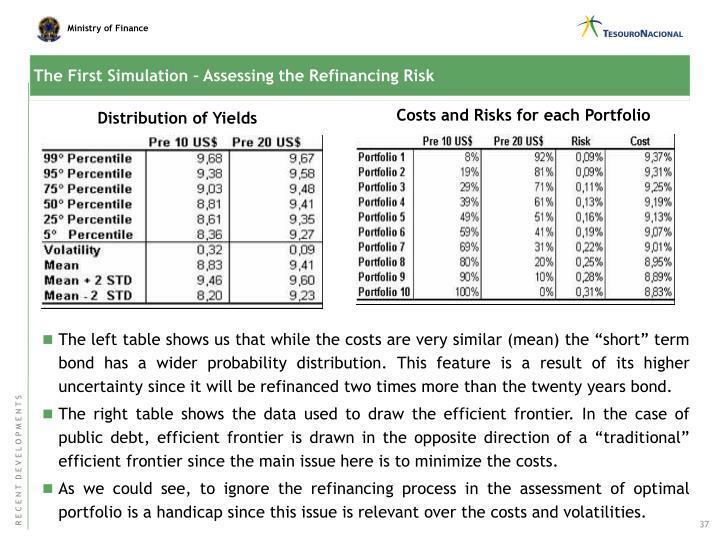 As we could see, to ignore the refinancing process in the assessment of optimal portfolio is a handicap since this issue is relevant over the costs and volatilities. 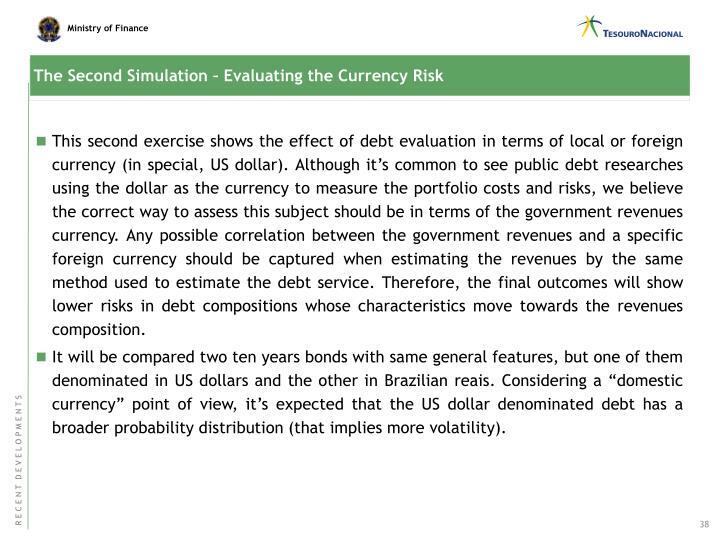 This second exercise shows the effect of debt evaluation in terms of local or foreign currency (in special, US dollar). 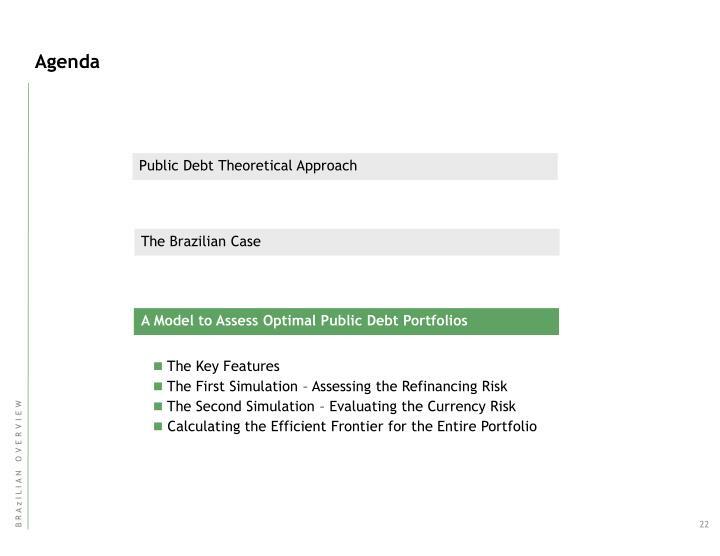 Although it’s common to see public debt researches using the dollar as the currency to measure the portfolio costs and risks, we believe the correct way to assess this subject should be in terms of the government revenues currency. Any possible correlation between the government revenues and a specific foreign currency should be captured when estimating the revenues by the same method used to estimate the debt service. 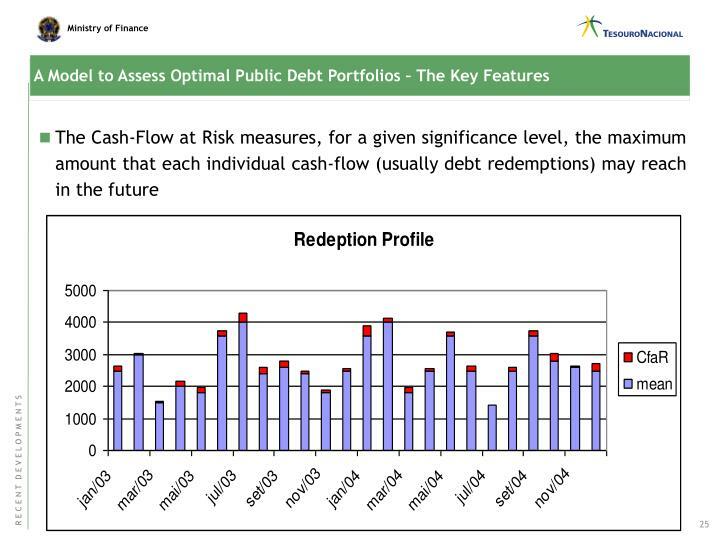 Therefore, the final outcomes will show lower risks in debt compositions whose characteristics move towards the revenues composition. 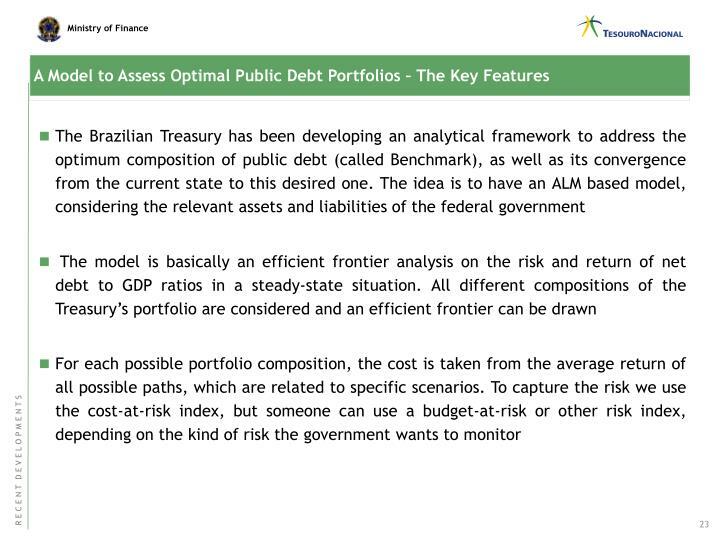 It will be compared two ten years bonds with same general features, but one of them denominated in US dollars and the other in Brazilian reais. 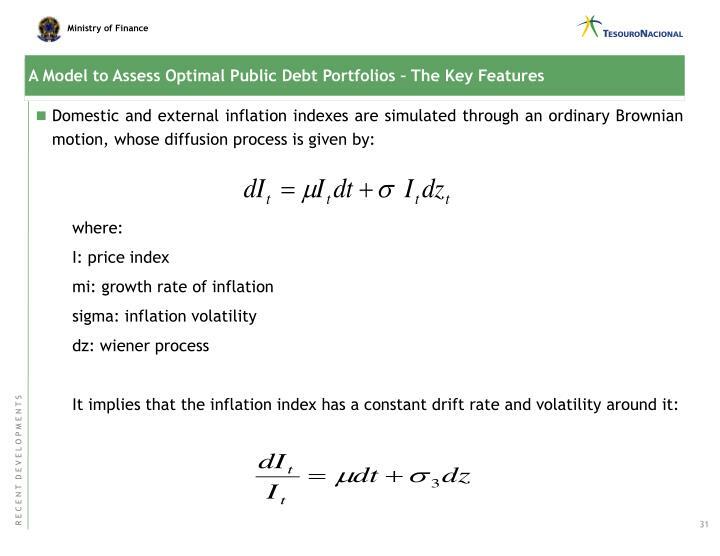 Considering a “domestic currency” point of view, it’s expected that the US dollar denominated debt has a broader probability distribution (that implies more volatility). 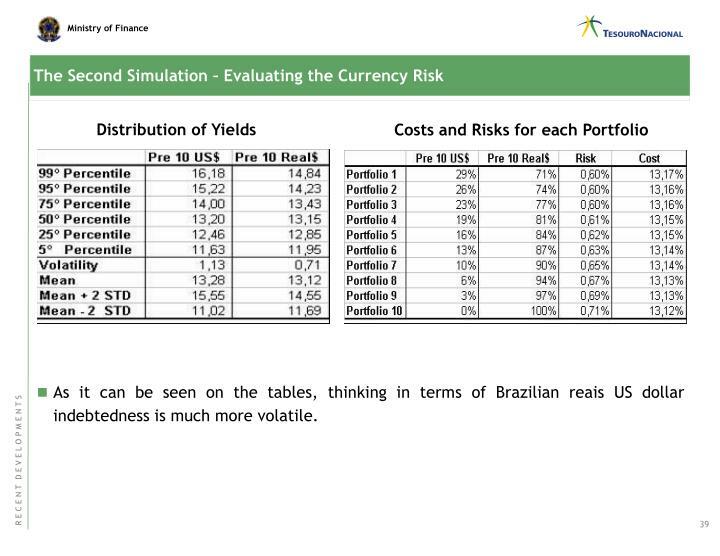 As it can be seen on the tables, thinking in terms of Brazilian reais US dollar indebtedness is much more volatile. 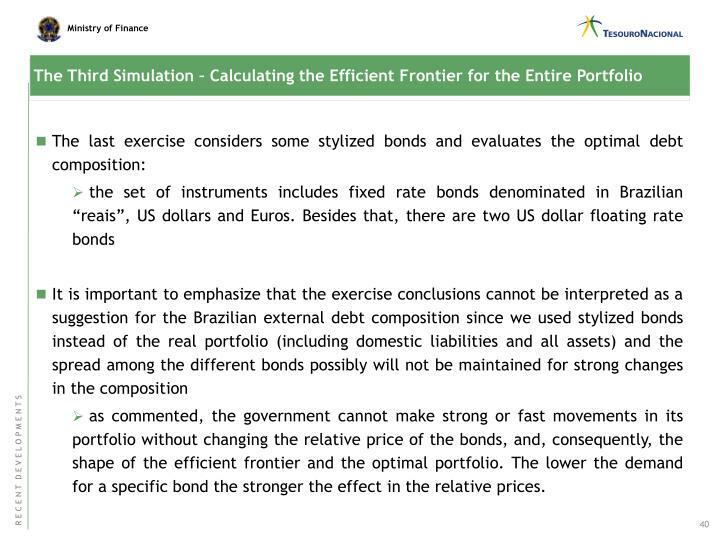 as commented, the government cannot make strong or fast movements in its portfolio without changing the relative price of the bonds, and, consequently, the shape of the efficient frontier and the optimal portfolio. The lower the demand for a specific bond the stronger the effect in the relative prices. As expected, floating rate bonds in US dollars are, on average, less expensive and more volatile, comparatively withthe fixed rate bonds in US dollars. In fact, the US dollar floating rate bonds have the higher volatility among all bonds. 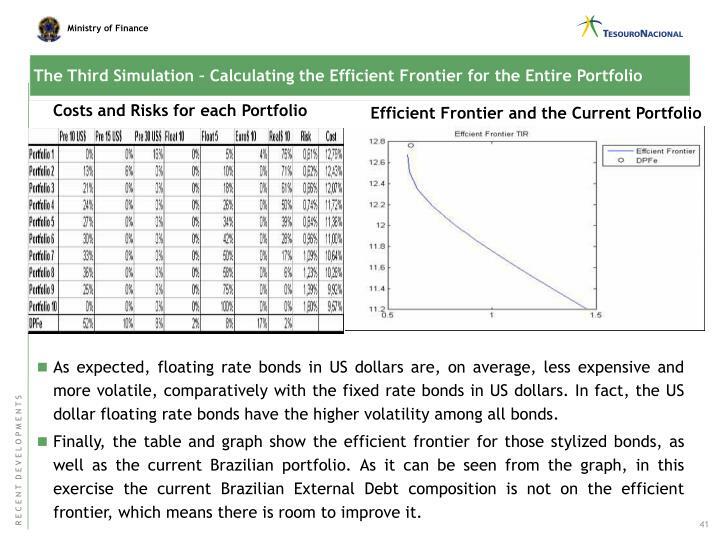 Finally, the table and graph show the efficient frontier for those stylized bonds, as well as the current Brazilian portfolio. 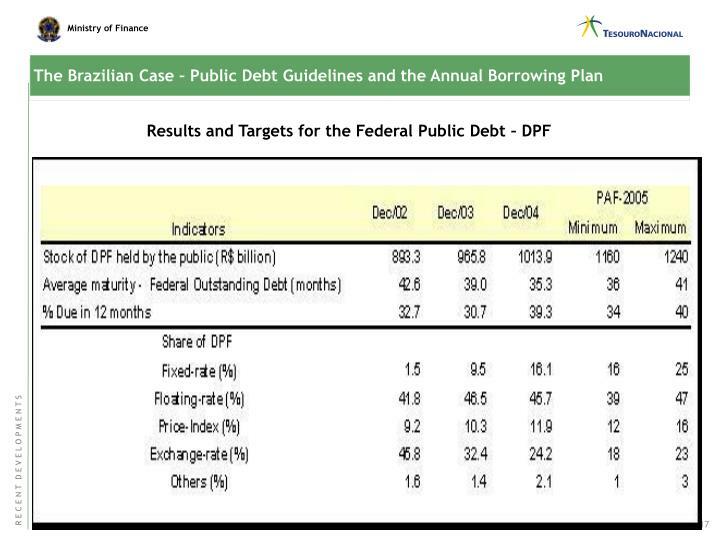 As it can be seen from the graph, in this exercise the current Brazilian External Debt composition is not on the efficient frontier, which means there is room to improve it.